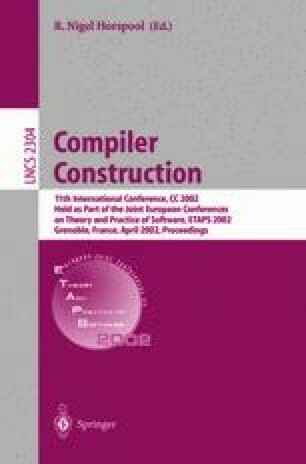 Much academic and industrial effort has been invested in compiler construction. Numerous tools and environments1 have been developed to improve compiler quality while reducing implementation and maintenance costs. P. Boullier and P. Deschamp. Le système SYNTAX: Manuel d’utilisation et de mise en œuvre sous Unix. http://www-rocq.inria.fr/oscar/www/syntax, 1997. M. Sighireanu. LOTOS NT User’s Manual (Version 2.1). INRIA projet VASY. ftp://ftp.inrialpes.fr/pub/vasy/traian/manual.ps.Z, November 2000.